UNITED NATIONS, July 17 -- After UN security official Louis Maxwell was killed in Kabul, it seems clear by Afghan national forces, rather than fully push the government of Hamid Karzai for accountability, the UN took other actions. UN officials flew to meet Maxwell's family members who had contacted Inner City Press complaining of a cover up, and tried to convince them differently. Inner City Press was told that it was difficult for the UN to push for “just one individual,” when so many have died in Afghanistan. That may be true, but runs counter to what the UN says about backing up its staff, and about accountability. On Louis Maxwell, Eliasson to his credit said he would look into it and get back with an answer. And now, today, he has. On his way into the Security Council on Wednesday to speak on the protection of journalists, he told Inner City Press he had just sent his answer on Maxwell to the Spokesperson's office. You asked the Deputy Secretary-General whether during his trip to Afghanistan there had been any discussion about Louis Maxwell, the Close Protection Officer who was one of the five United Nations staff members who lost their lives in the 2009 terrorist attack on the Bakhtar guest house in Kabul. The Deputy Secretary-General can attest that the memory, as well as the legacy of the Bakhtar attack is still part of daily life for UNAMA staff who, since the attack, now live in the same secured and fortified compounds in which they work (although as the Deputy Secretary-General mentioned during his briefing, even there they have to spend some nights in bunkers). While the Deputy Secretary-General discussed the need to protect civilians, including those working for international organizations, Mr. Maxwell's tragic death and that of his four UN colleagues and of the three Afghan security personnel who also perished in the attack, was not specifically discussed in his meetings. The Deputy Secretary-General has looked into the matter and has learned that the report of the Board of Inquiry into the attack suggested the possibility that Mr. Maxwell may have been killed by Afghan security forces responding to the attack, who may have mistaken him for an insurgent. The Secretary-General has called on the Afghan authorities to ensure a thorough investigation into the attack and the death of United Nations staff. We have yet to receive a formal response and we continue to seek one. How hard the UN will “continue to seek” a formal response remains to be seen. But Eliasson looking into it and having the above sent in much appreciated. It is to advance the right and ability of journalists to pursue such questions that Inner City Press co-founded the Free UN Coalition for Access. The UN Secretariat's most recent response? 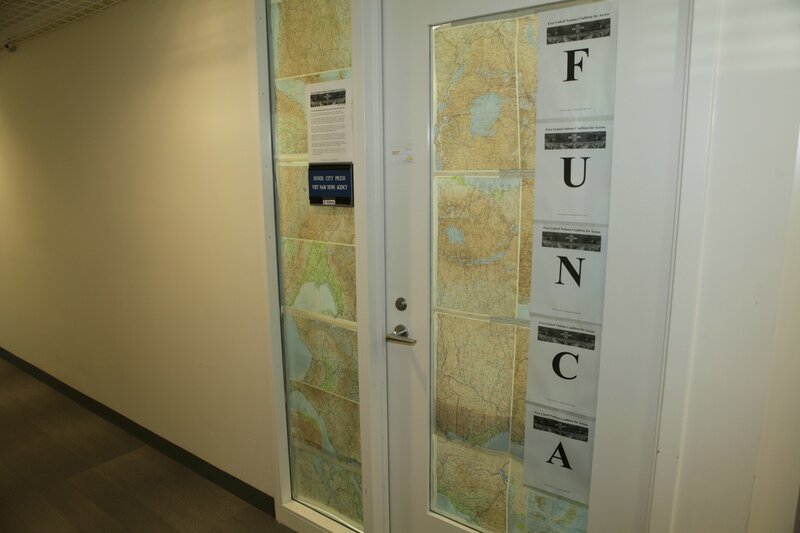 To threaten to suspend or withdraw the accreditation of Inner City Press, for merely hanging a sign of FUNCA on the door to its and its office mate's office. More soon on this other question. Watch this site.